You have to admit that us Americans are pretty spoiled with the wide variety of sports we can play. From my house I can walk across the street to a nice indoor basketball court available to me at almost any time of day for free. There are baseball diamonds, basketball hoops and football fields within a short walking distance from my front door. It is the same for almost anyone in America. No matter your background or where you live, there is always a sport to play. With that being said, you also have to take into consideration the equipment that has to accompany each one of these sports. To play basketball you have to have a hoop. For football you don’t necessarily need pads, but you sure do need that special kind of ball. I think you get the idea. It makes it hard to just walk outside and start playing. With soccer that is not the case at all. Soccer is one of the few games I can think of where you need a ball and nothing else. I have seen soccer balls made out of rags tied together and then kicked around on a street. Adding goals is easy enough: all you need to do is lay a couple of pebbles in the street, on a field, in a parking lot, or even the hallway of an apartment building and voila, you are set. In countries where there is hardly enough money to pay for food, you can bet there is no money for a basketball hoop or the concrete needed to bounce the ball. Yet you will still see kids playing soccer- all you need is a ball. No wonder so many people around the world play soccer. It costs next to nothing. As soccer continues to take hold in our country, we so easily turn a blind eye to the talent playing at the professional level. The kids who s were in the streets of Mexico and Europe kicking rags so many years ago, dreaming they would one day be stars, are now contending for the playoff title. They have come to America to finish already successful careers, and you’d better believe they have been instrumental in getting their teams to the finals of each conference respectively. 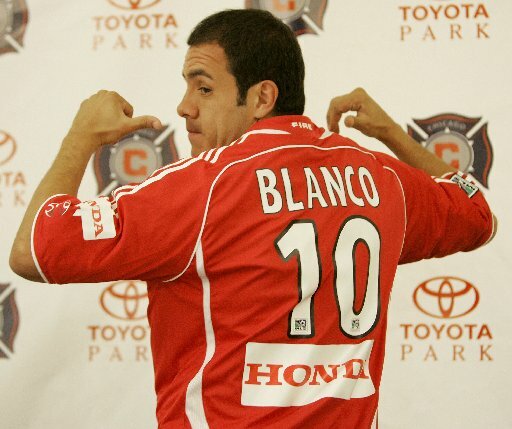 David Beckham of the Los Angeles Galaxy and Cuauhtemoc Blanco of the Chicago Fire are only two players of a long list of talented foreigners now playing in the MLS. There are few places outside the Unites States where they can go through a crowd unnoticed. Sure, LeBron James can draw a crowd of 20,000 for an NBA game, but these two can double the attendance without even coming off the bench. That is true star power. Fortunately both of them live up to expectations and play incredible soccer. This weekend their names alone won’t be able to move them closer to the championship. They will have to come together with the other ten men on their team to solidify their chances. So did you watch soccer over the past couple of weekends after I encouraged you? If not, starting this Friday, you have a chance to redeem yourself and watch two of the most influential soccer players ever. Watching these two world legends play is like watching Magic Johnson and Larry Bird. One day your kids will be watching old film, and you can say you witnessed it live. In the Western Conference Finals, the Houston Dynamo and Los Angeles Galaxy will play in L.A., while Real Salt Lake and the Chicago Fire play in the windy city. Since these are the conference finals, we are now in the single elimination stages. These teams only have one chance to move on. Logan Millard works and lives in Salt Lake City, Utah. Aside from his full time job he works for the Utah Jazz as a media relations coordinator on game nights, and also helps Fox Soccer Channel when they are in town. What Happened to Landon Donovan’s Uniform from the 2011 MLS Cup?